Kirkwood Trading Company screen printing in St. Louis provides custom tees for fundraising. Fundraising with custom tees is a great way to get your target donors attention. T-shirts are an inexpensive medium with a high profit which makes them work for just about any cause. By fundraising with custom tees you are giving your donors something tangible with their donation. I can bore you with all the market research that studies the perfentage of people who donate when they do in fact receive a tangible item for their donating efforts, but statistics are boring. I’ll just tell you that if you look at all the annual fundraising that takes place, each and every year these organizations are giving a tangible item away in return for donations. Whether it’s a tootsie roll from the cub scouts or Fireman, or a tote bag from the local independent tv station, donors are more likely to give money when they recieve something in return and the size of that something is really not a concern to them. 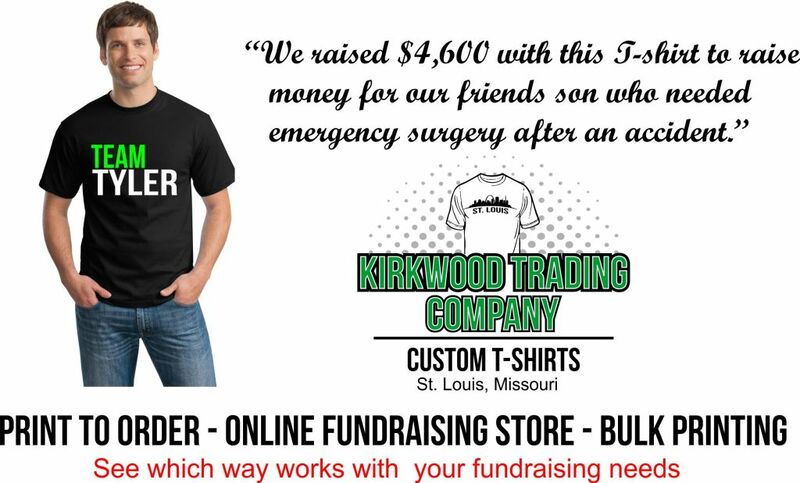 Recently Kirkwood Trading Company provided custom t-shirts for a fundraising effort put on by a group of guys who had a good friend whose son had a fluke accident and required emergency surgery. While the parents had health insurance on their son we all know there are still costs associated with medical procedures that are not covered such as co-pays. Their biggest concern was going to be the lost wages of the parents while their son spent time recuperating after the surgery. As a parent you want to be by your child’s side which often times means missing work. In situations like this few people think about things like lost wages of loved ones who become the patients care givers for a period of time. So these friends needed a quick way to raise funds that would also be attractive to a large amount of people. So they decided on a t-shirt. They brought us the phrase they wanted to use, told us about the child’s favorite colors, and within a few minutes we had a working design based on their wishes. We printed up the shirts to spec and they in turn took the custom t-shirts for the fundraising event and sold a few hundred of them and raised $4,600 over the course of a long evening. It’s about raising funds and helping a family out so when someone gives $20 for a t-shirt, that is enough of a return that the are willing to donate. With a t-shirt not only are you giving a tangible item but it also becomes a marketing tool. A lot of people use fundraising with custom tees to raise awareness. They get a donation and in return give the donor a t-shirt with their cause printed on the shirt. When they shirt is being worn by the donor, that donor in turn becomes a walking billboard for the cause. There are a few ways to order custom t-shirts and it’s no different when it comes to fundraising. We can print on demand, you tell use the sizes and quantity you need based on pre-orders. We can print in bulk so if you think you can sell 400 t-shirts we’ll print you 400 t-shirts in various sizes. Lastly we can do a fundraising store. The fundraising store is a great way to allow your message to be broadcast to a massive amount of people in a short time. The fundraising stores don’t cost anything to do and the costs associated with them get taken out with each purchase so there is no upfront money. Kirkwood Trading Company will work with you to find the best solution for your efforts. If you’d like to do fundraising with custom tees contact us and we’ll be happy to discuss the best practices from the type of shirt, design, and quantities that work best.